Moray LEADER has launched a new leaflet highlighting the fact that they can offer funding to farm businesses that are seeking to branch out into non-agricultural enterprises to diversify their economic activity and support the farm business further. So, for example, LEADER Farm Diversification Funding could be used to set up a new tourist-related enterprise or a food and drinks retail business supplied by a farm. It cannot be used for any activity that is purely agricultural. Moray LEADER Programme Manager Norman MacAskill said: "Farm businesses haven't always looked to LEADER for support but in this programme, we are keen to support them to diversify their activities and develop new enterprises. This doesn't mean moving out of farming - it's about strengthening the base of their business through diversification into other kinds of enterprise. 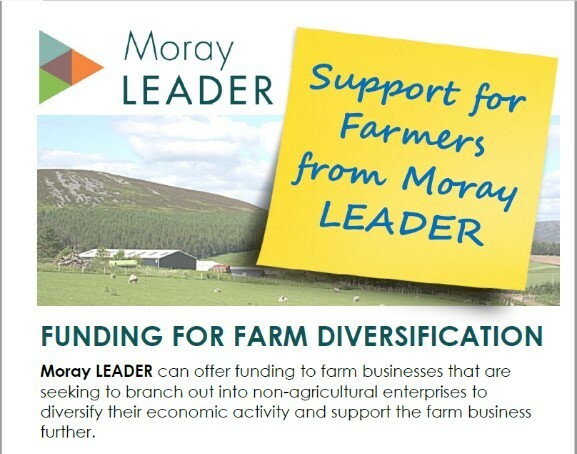 "Any agricultural business that is located in Moray and registered with the Rural Payments and Inspections Division (RPID) could be eligible for this funding, so if you have an idea for a project, do get in touch by emailing info@morayleader.org.uk or calling us on 01343 818570."